Thank you for visiting us! You have found THE source for work trucks on the Internet! At Bruce Essick, you can find the exact truck you need - every time. Why? Because we have a complete inventory of work trucks, and can custom build or convert a truck to meet your specific requirements. In addition to helping you get a truck, we can provide you with complete service as well. Need financing or lease options? We can help with that, too! 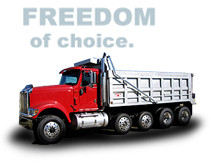 We invite you to browse through our site and our trucks. We invite you to discover the freedom of choice.